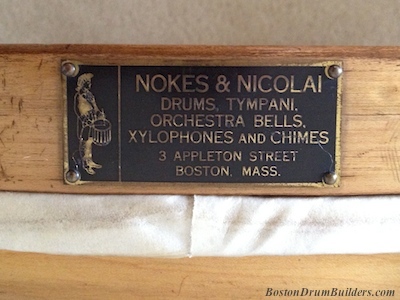 Early 20th century Boston drum builders Nokes & Nicolai catered greatly to the needs of theater drummers of the day. 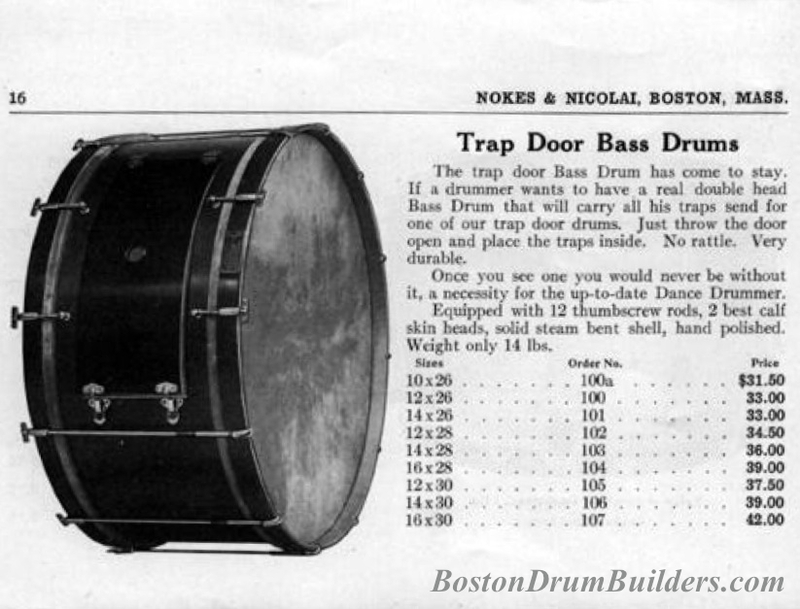 These and other such drummers on the move would have been the main target demographic for the Trap Door Bass Drum. This design was not unique to Nokes & Nicolai. 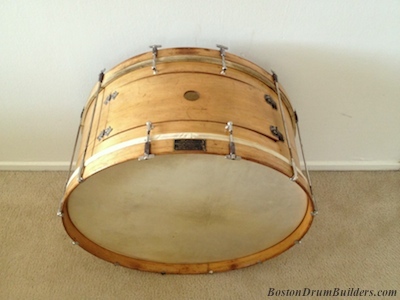 Companies such as Duplex of St. Louis and Boston's own George B Stone & Son marketed similar bass drums. 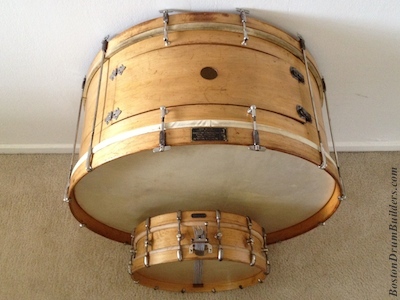 The idea was that a gigging drummer could store all of his "traps" or small instruments and sound effects inside of the bass drum thereby saving space and improving portability. This particular example is in fair condition with the finish somewhat worn from age and years of responsible but substantial use. The shell has several cracks radiating out from the trap door and where the hinges that attach the door. 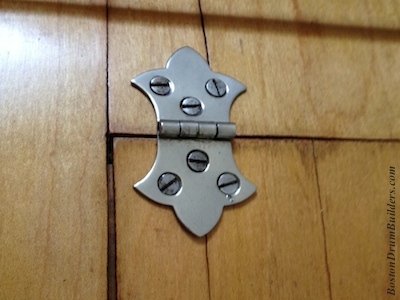 The hardware shows significant plate loss the worst of which is on the steel parts such as the thumbscrew side claws and the latches used to secure the door shut. 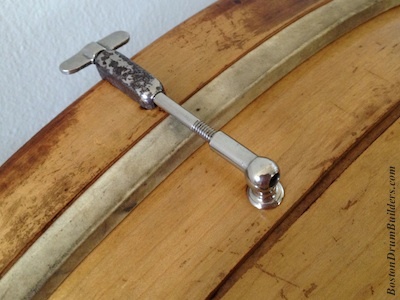 Also, the wooden grommet which mounted into the vent hole at the top of the drum has long since gone missing. But the drum is not without charm. The badge is well preserved and lists the company's address of 3 Appleton Street in Boston, Mass. 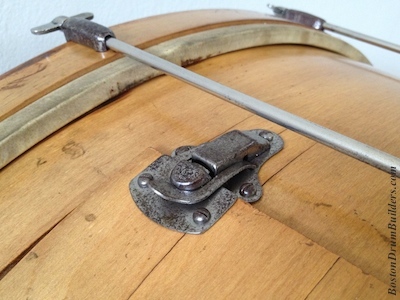 The nickel plated brass hinges which attach the trap door are an interesting visual detail on an otherwise utilitarian drum. 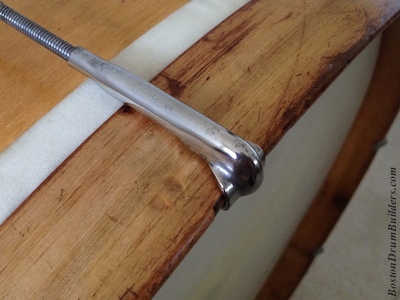 And the four single ended, single post tube lugs - two on each side mounted at the top of the drum - leave room for the trap door to open and close. 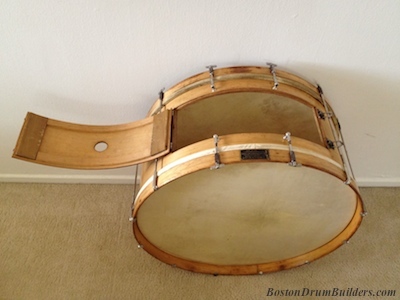 This Trap Door Bass Drum came to me from a seller on Cape Cod in the Spring of 2010 along with a matching Separate Tension Orchestra Drum and a briefcase full of traps and accessories which made for a fascinating time capsule find. Do you have an instrument made by Nokes & Nicolai? I want to hear from you! Send Lee an email at lee@vinson.net.